Western comments on Russian domestic and foreign affairs have, during the last years, become more and more gloomy. Among other topics, this pessimistic discourse (to which I too have contributed) features Putin’s neo-imperial plans for the post-Soviet area, the many varieties of post-Soviet Russian ultra-nationalism, the fragility of the geopolitical grey zone between the Kremlin-dominated sphere on the one side and NATO in the other, Moscow’s subversion of the foundations of the world’s nuclear non-proliferation regime (via its attack on the nuclear-weapons-free NPT signatory Ukraine), the catastrophic scenario of a full-scale Russian-Ukrainian war, the grave repercussions of such a new escalation for the whole of East-Central Europe, and the continuing Western naivety with regard to the origins, nature, functioning and aims of the current regime in Moscow. To be sure, arguments like these have been and are still necessary to be made as they are, so far, insufficiently salient in Western mass media. Yet, it may also be time for developing in parallel a different approach to Russia’s future. At least that is what recent history and the aftermath of the Cold War’s end suggests. In 1991, the sudden collapse of the Soviet Union opened an unexpected window of opportunity for the creation of a comprehensive, cooperative and stable European security and economic order. A major reason that this fortunate chance has been missed was that the Western community of experts on Eastern Europe had, even as Mikhail Gorbachev’s perestroika was slowly turning into a full-scale revolution, not foreseen such an outcome. Most observers kept focusing on the USSR’s remaining imperfections – until the Soviet state did not exist anymore. The West had, before this event, not developed a clear understanding of, and coherent plan for, a situation in which the Russian communist regime would disappear, and an independent Russia would embark on the road to gradual Westernization. Most analysts would have regarded such a scenario as idle fantasy before 1991. As a result, during the 1990s, Western policies towards the new Russian Federation were formulated ad hoc, largely uncoordinated between the various actors involved, and without a clear vision of what Eastern Europe’s future structure should eventually look like. It is true that various steps towards a rapprochement with Russia and cooperation with the newly independent states were taken by this or that national Western government and international organization, such as the IMF, G7, Council of Europe or NATO. Yet, there was little appreciation of the uniqueness of the world-historic opportunity on the table, and the enormous stakes involved in getting this critical moment right. Instead of being guided by historic sensitivity, coherent strategy and appealing teleology, Western approaches towards the post-Soviet world were characterized by spontaneity, complacency and hesitancy. The more sustained approaches, like the EU’s Strategic and Modernization Partnerships with Russia, were only introduced, in in 2003 and 2008 respectively, i.e. after the “Putin System” had started to take shape – and when it was thus already too late. We are now paying the price for this grave geopolitical omission of Brussels, Berlin and Washington. This was in contrast to the West’s behavior vis-a-vis post-fascist West Germany, in the 1950s, that was treated remarkably differently from the post-imperial Weimar Republic in the 1920s. Although the Germans had, only a few years before, to be defeated, in a world war, and remained for many years excluded from the United Nations, the Federal Republic that emerged in 1949 was swiftly integrated into the major new Western institutions. In 1951, West Germany became a member of the European Coal and Steel Community, in 1955 of NATO, in 1957 of the European Economic and Atomic Energy Communities, and in 1958 of the European Parliamentary Assembly. In spite of much good will on the side of the EU and US towards Boris Yeltsin’s Russia, nothing even remotely reminiscent of this course of action vis-à-vis the young FRG happened in Western policies towards the young Russian Federation after the break-up of the Soviet Union in 1991. Somewhat predictably, Russia – reminding the decline of German democracy after World War I – eventually returned to its imperial and autocratic traditions, under Putin. Today, there are reasons to believe that we may, nevertheless, sooner or later again be offered a chance to draw Russia into the Western community of states, and that it may make sense to already now prepare for such an optimistic turn of events. A positive agenda for a post-Putinist Russia could itself become a factor of its realization, and get us away from permanent repetition of doomsday scenarios. Moreover, for a prophecy getting the chance to become self-fulfilling, it needs to be stated, in the first place. A vision of how a future non-imperialist and democratic Russia could be gradually integrated into the Western community of states could, as such, become an instrument for Russian democrats, European diplomats, Western politicians and international civil society in their furthering of such a scenario. Yet, there is, so far, little thinking about a completely different Russia and how to bring it about, in the West. As in the 1980s, the recent past is seen as the prime or even only analytically sound guide to the future. Anything beyond either mere extrapolation of the present, or some even more grim prediction for the future appears as day-dreaming. Putin’s regime as well as its drummers in and outside Russia are themselves setting this agenda: All we can get from Moscow, so the story goes, is either accommodation or confrontation. At worst, instead of the current aggressive kleptocracy, a still more dangerous Russian fascist ideocracy could be in the wings. The Kremlin’s projection of Russian power, intransigence and unpredictability is finding fertile ground in a Western analytical culture characterized by cautiousness, skepticism and pessimism. Yet, how likely are a continuation or escalation rather than relaxation or dissipation of the current tensions in Russian-Western relations? To be sure, Moscow’s relations with the West may have to get first worse before they get better. Before it eventually self-destroys, Russia’s unviable kleptocratic order might have to go through big convulsions and a period that would be very risky for everybody involved – perhaps, even for the whole of humanity. Yet, chances are that sooner or later Russia will turn again to the West and be ready not only for resumption of its pre-Putinist political course and relationships to the West. There may even emerge the chance for a start of Russia’s all-out integration into Western economic and security structures. Such a turn of events may not only mean a second future opportunity to create a “common European home,” as once envisaged by Gorbachev. The very prospect of such a fundamental redefinition of Russian-Western relations and the transcendence of Europe’s current division via Russia’s gradual inclusion into the West can and should be itself seen as a mean to bring about that future. The fundamental challenge to the continuing existence of Russia’s domestically kleptocratic and internationally aggressive regime, during the coming years, is a toxic combination of two trends that even clever leadership in the Kremlin may not be able to handle at once. First, unless the price of crude oil shoots up again, the non-competitiveness and underperformance of Russia’s current socio-economic order will become ever more obvious. With every year, the pie that can be divided between Russia’s various rent-seekers will get smaller. The concurrent loss of Russia’s relative economic dynamism, international weight and foreign influence will become ever more visible and depressing to Russia’s elite. The Eurasian Economic Union may become either irrelevant or even collapse. The financial burden of sustaining Russia’s various formally or informally annexed territories and satellite regimes may become unbearable. Unless a major non-Western economic power like Japan or China starts perceiving Russia not merely as a trading partner and raw materials provider, but as a close political friend to be actively supported and integrated with, the lack of Russia’s economic prospects on its own will become increasingly obvious to educated Russians. A resolute, charismatic and widely accepted ruler may, to be sure, be able to compensate, during a long period of time, for the various problems this creates for the stability of the current Russian polity. Yet, for biological, constitutional and political reasons, it is not entirely clear how long Putin will be able to provide such leadership, and whether his patronalistic regime can arrange for an orderly transfer of power to a suitable successor. Until 2024, the end of Putin’s fourth term as president, the leadership issue may not yet become urgent. But already today, the question that everybody in Russia’s clientelist system is asking her- or himself is: What comes afterwards? Certainly, Putin can, in 2024, put again a seat-holder in place, like he did with Dmitry Medvedev who was his palliative regent in 2008-2012. Yet, the chances of Putin coming, in 2030, back as a fully accepted leader at the age of 77 are unclear. Russia had, in its Soviet incarnation, already once experienced a gerontocracy during Leonid Brezhnev’s, Konstantin Chernenko’s and Yuri Andropov’s rule in the late 1970s and early 1980s. The Russian people only know too well what such rule by old men eventually leads to. Therefore, the likely change in the presidential office in 2024 (or before) may, by many within Russia’s leadership, be already regarded as a rather consequential one. The president to be put in place after Putin’s fourth term could be also his long-term successor as Russia’s real future leader. With Putin likely to start his gradual departure from politics already in 2024, if not earlier, the stakes of this profound change will thus be much higher than the transfer of the presidency to Medvedev in 2008. At least, such calculations and speculations are probably now being made by many holders of power, privilege and property in Moscow. They probably, even more so than Western observers, wonder what Putin’s slowly approaching departure means for their future and security, and how they should behave to survive this switch – both metaphorically and literally. The spectacular bizarre arrest, unfair trial and eventual long-term imprisonment of Minister of Economic Development Aleksei Ulyukaev in 2016-2017 has increased the stakes of the upcoming leadership succession. It has turned the question of who will be Russia’s next ruler and how stable this new regime will be into an existential issue even for the members of Putin’s innermost circle. All this creates already now volatility in the system – a tendency that will likely increase and may turn into a serious, potentially democratizing conflict between various factions of Russia’s elite. 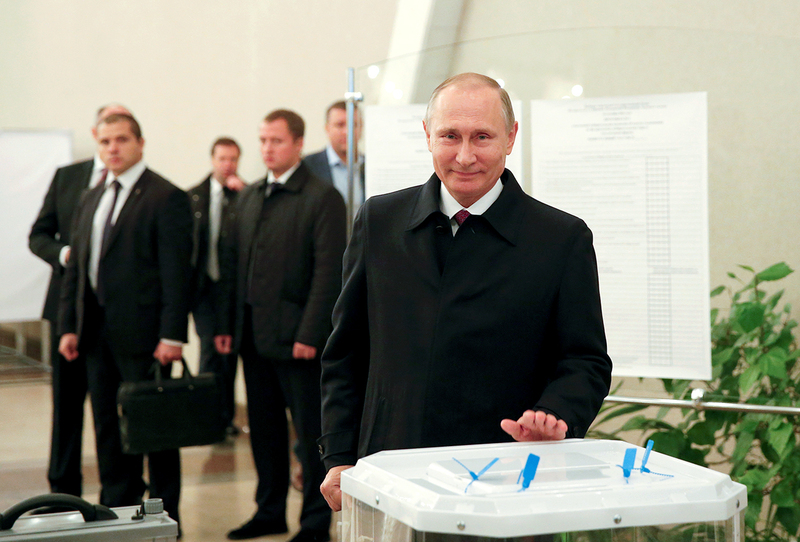 A smooth succession from Putin to a new leader and preservation of the current authoritarian order would, perhaps, be possible under conditions of dynamic socio-economic development, as Russia was experiencing during the early and mid-2000s. Yet, the simultaneity of economic stagnation and momentous political transition makes the task of replacing – without meaningful and open-ended democratic elections – the current charismatic leader with a sufficiently accepted alternative figure difficult. Accumulating repercussions of past blunders by the Russian leadership, such as the accidental shooting of a Malaysian passenger plane over Eastern Ukraine in July 2014, or the effects of future mistakes of a Kremlin increasingly cornered by various pressures from within and outside Russia, such as new sanctions measures by the US, may further increase the speed of decline of the current regime. What the sooner or later resulting destabilization of Russia’s political regime implies internationally is difficult to predict. Most analysts tend to foresee either a nevertheless high continuity and reconstitution of the current order, with a new leader, or a worsening of the situation via, for instance, a further radicalization and even fascisticization of the current system. Yet, both of these scenarios would leave the current Russian socio-economic contradictions and imperfections in place or make them even more salient as a result, for instance, of an escalating trade war with the West. Given Russia’s far-going inclusion into the world economy, inability to become autarkic, and continuing close economic ties with the West, a course or regime change in Moscow may thus eventually lead to a renewal of the rapprochement with the West started in the late 1980s. While it is so far unclear how and when exactly a Russian pro-Western turn would come about, it is – at least, in the long run, if not already in the mid-term future – not unlikely. Both the unavailability of other sustainable geoeconomic options for Russia as well as the cultural affinity of most Russians with European traditions will sooner or later drive the Kremlin back into the arms of the West. Once that happens, the West should – unlike in 1991 – already have a comprehensive plan of action in the drawer. A crucial precondition for Russian-Western reconciliation will be Russia’s disengagement from its various expansionist adventures in Eastern Europe and the Southern Caucasus as well as its cooperation in other world regions, such as the Middle East. The Kremlin would have to abolish its proxy regimes in Transnistria, Abkhazia, South Ossetia and the Donets Basin as well as reverse the annexation of the Crimean peninsula – the later issue being the thorniest one. Russia’s redefinition as a liberal democratic and territorially saturated nation-state rather than revanchist imperial and paranoid anti-Western power would have to start from inside. Yet it can, should and may even have to be supported from outside, in order to be successful. In particular, the EU and US could indicate to the Russians the advantages of giving up their irredentist claims in the former USSR. The West should thus already now announce a comprehensive agenda for a far-going association with, and partial incorporation of, Russia that would go beyond mere restoration of previous cooperation schemes under former Russian Presidents Yeltsin and Medvedev. Such a plan could be part of a larger package for a novel type of partnership that would link a withdrawal of Russian regular troops and irregular units (agents, mercenaries, volunteers, adventurers et al.) from currently occupied territories, on the one side, with an offer of gradual Western integration tackling humanitarian, economic and security issues, on the other. Not only could a re-democratizing and post-imperial Russia re-enter the G7 turning it into the G8 again, reset its Strategic and Modernization Partnerships with the EU, reestablish fully its joint council with NATO, and resume its OECD accession negotiations interrupted in 2014. The EU’s current projects within its Eastern Partnership (EaP) initiative could become templates for a far more intense and much deeper affiliation between Brussels and Moscow than before 2014. Depending on whether the Eurasian Economic Union (EEU) survives or not, the EU could propose either the Russian state alone or all members of the EEU a number of partial integration schemes that would include them into a Wider Europe and let them participate to one degree or another in Western political processes as well as non-political life. In particular, modified versions of the Visa Liberalization Action Plans and Association Agreements that the EU has been implementing, over the last years, with Ukraine, Georgia and Moldova could be also offered to Russia and its current allies. After Moscow’s adoption of a number of necessary laws and implementation of preparatory regulations, Russian citizens could, in a first step, be granted the right to travel visa-free within the Schengen Area. The US could consider to offer Russia, after adequate preparation, an inclusion in its visa waiver program, and Electronic System of Travel Authorization. The conclusion, in a second step, of an EaP-type Association Agreement that includes a deep and comprehensive free-trade area (DCFTA) with Moscow could do two things at once. First, it would lay out a concrete path for how Russia can gradually become part and parcel of the EU’s economic and legal space. Second, such an Agreement would reconnect with each other the post-Soviet economies of Russia (and possibly other EEU members) with those of Ukraine, Georgia and Moldova who are already implementing DCFTAs with the EU. It would thereby address a major point of critique regarding the current integration into the EU of the associated Eastern Partnership economies – namely, that they are being thereby gradually disconnected from their traditional markets and partners in the former Soviet Union. The geopolitically most far-reaching proposition that Brussels and Washington should make to Moscow already now is to jointly start implementing a Membership Action Plan leading Russia eventually towards an accession to NATO, as a full member state. Russia’s gradual preparation for, and eventual inclusion into, the North-Atlantic alliance would, as in the case of an EU Association Agreement, help to solve two salient issues simultaneously. It would, first, locate Russia in the world’s most powerful security alliance and thereby help to alleviate the historically deep-seated angst of foreign invasion, in the Russian collective soul – a major reason for the current instability in world politics. It would, second, erase the Russian-Western quarrel around previous NATO enlargements and the possible accession of further post-Soviet countries to the Alliance. Russia’s eventual entry into the North-Atlantic alliance could be part of a grand bargain for Eastern Europe and the Southern Caucasus that combines a full Russian denouncement of irredentism, with a resolute Western embrace of Moscow. One could imagine a major international act within which NATO would sign concurrent accession treaties with Russia, Ukraine and Georgia, as well as, perhaps, other post-Soviet countries. Abkhazia and South Ossetia would return under Tbilisi’s official control, Crimea and the Donets Basin, if it continues to remain occupied, under Kyiv’s official control. Within such a scheme, some of the currently illegal Russian troops and agencies on Georgian and Ukrainian soil may be even able to remain in the previously formally or informally occupied territories of Ukraine and Georgia. Via Russia’s accession to NATO they would turn into allied structures supporting rather than threating Georgian and Ukrainian security. No question: Fancy schemes like this may look now like wild speculations. Some will regard them as unserious fantasy. Yet, the geopolitical constellation of the post-Soviet space has become unusually complicated. It may be impossible to overcome them without designing, publishing and implementing some unheard-off plan. The usefulness of a new visionary Western agenda for “another Russia” – such has been the name of one of Russia’s main opposition associations – would not only lie in the fact that it may become possible to be implemented should a radically different constellation in Eastern Europe eventually emerge. Developing such plan today would provide an instrument to promote such a post-Putinist change itself. One of the reasons for Moscow’s increasingly aggressive posture in world politics and current erratic search for foreign allies is the deadlock in the development of Russia’s international embeddedness, after the annexation of Crimea. In spite of the Kremlin’s eager promotion of the idea of a “multipolarity,” Russia is economically too weak to become itself a self-sustaining pole in a competitive multi-polar world and instable geopolitical environment. Its current partnering with China, Turkey, Iran and other non-Western powers will remain of a limited nature as it will only occasionally lead to win-win situations for all sides involved. The Russian cultural affinity with, and geopolitical orientation towards, Europe will not only remain latent, but sooner or later become prevalent again. As times goes by, Ukraine’s and other post-Soviet republics’ continuing integration into the West will become an increasingly attractive role model for Russians too. The unsustainability of Russia’s kleptocratic order and illiberal policies at home as well as the overreach of its revanchist behavior and neo-imperial posturing abroad will become more and more visible to the Russian elite and population. By formulating and publicizing an alternative view of Russia’s geopolitical future, the West can help to hasten a change of course in Moscow, and should prepare itself for the moment when the tipping point is finally reached.